Well, at last, here it is. Watch, enjoy, share, like. 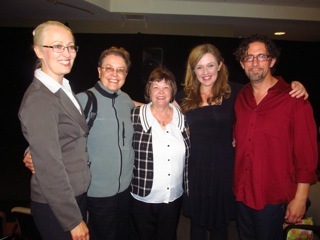 Leilani Muir (centre) with Sandra Anderson (to her right) and the cast of The Invisible Child. At the Alberta Literary Awards last night, the play The Invisible Child received the Gwen Pharis Ringwood Award for outstanding play. The play was written by David Cheoros, Lou Morin, and Leilani Muir (O’Malley), and was performed at last year’s Edmonton International Fringe Festival. A special reading of the play was given at the Living Archives team meeting in October 2012, and footage of both performances features in the Alberta Eugenics Awareness Week highlights video, which will be released later this week. Congratulations to the team that wrote and performed Invisible Child on this well-deserved honour! Eugenics in Australia: Melbourne’s Hidden History. In San Francisco, a group of Facing History and Ourselves students is spearheading a movement that could change public high school history classes for generations of future California teens. Their goal: to include California’s history with eugenics and sterilization in the state’s public high school curricula. To read more, see the original post.